Musical School is a modern, online resource to help teach the new Primary Music curriculum. It contains a full Scheme of Work for the new music curriculum and an alternative freestyle mode for you to create your own Scheme if you prefer. There are stunning whiteboard resources for every lesson, it’s very simple to follow and the children absolutely love it! Watch the video above to see what’s in Musical School or take out a free no-obligation trial to see it for yourself. 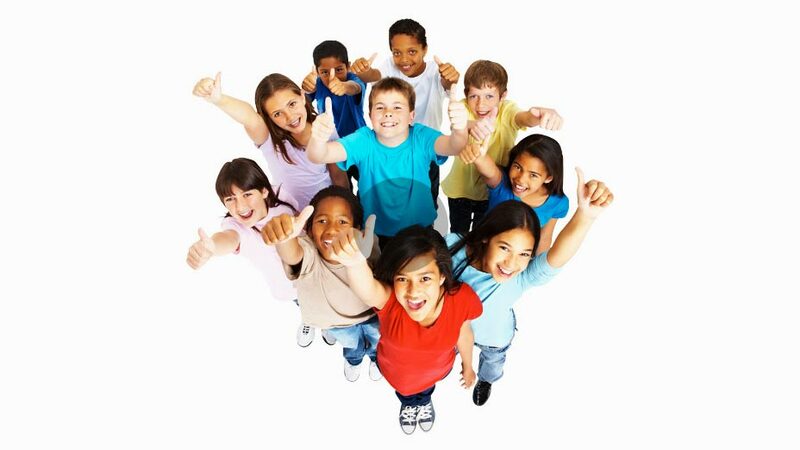 Get pricing for your school. In the past year, two masters theses have presented evidence that schools using the Charanga Musical School programme have experienced a significant improvement in music teaching. 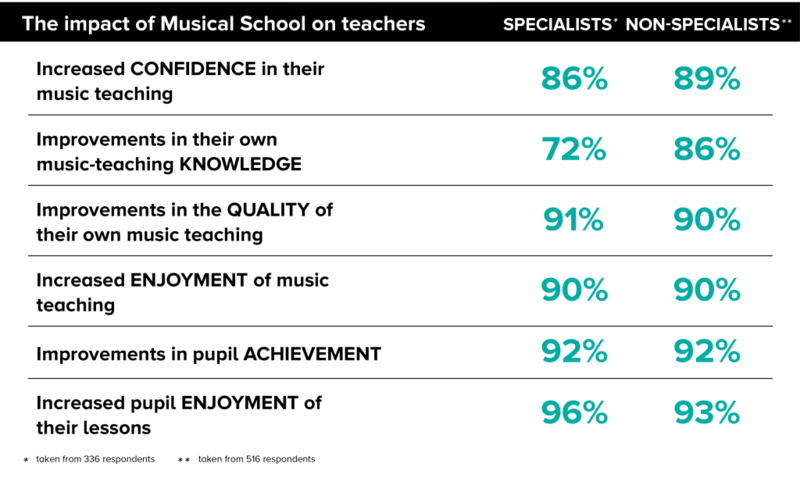 To gain additional insight into the effect of Musical School on music teaching we have also recently completed an extensive survey of teachers using the Musical School programme in their school. The total number of music teachers responding to the survey was 852 which was divided into 336 who described themselves as music specialists and 516 who said they were non-specialists. Day 2 of Charanga whole school lovin it! Song practice rocked! My own repertoire blown out the window with Don’t Stop Mamma Mia Livin on a Prayer Fantastic resources around each song recorders y3 loved Mamma Mia y4 recorders Adele Rhythm grid excellent. Music has just raised its game! I think Charanga is absolutely fantastic. I use the rhythm grids as a starter activity in all my classes and the pupils understanding of rhythm, the accuracy with which they perform has really improved. I use the recorder course with my clubs and they love all the songs. This half term I’m also teaching the hip hop topic with my y6s and it’s going really well. I look forward to some more exciting resources. I wanted to let you know how amazed I am with the quality of the resources I received from you. Everytime I access the website I find new resources which I know the children I work with will love and which are highly engaging teaching tools. I simply cannot believe how much work has gone into the creation of this amazing resource, which in my opinion all music teachers should be accessing! I know that over my years in teaching I have invested in many expensive resources none of which are in the same league as the Inspira resources. I am an Advanced Skills Teacher for Music and will whole heartedly be recommending Inspira to all the schools and organisations I work with, and the teachers I support, as an outstanding resource. I am a year 4 class teacher and even I have the confidence to deliver music using these resources they are brilliant and the kids love them! Read St John’s Primary School is a rural village primary school in Lancashire with approximately 200 children. The school took up the Musical School programme in 2012 and has since experienced an extremely positive reaction from teachers and children alike. Despite having a dedicated Music Coordinator and utilising various published music products such as Music Express, the school was struggling to find flexible, creative and innovative resources with which to fully engage the children. The school found that with its diverse pupil population, some of which were learning instruments through the music service, the school required a resource package that offered differentiated activities that could include all children. In all, the schools musical life lacked cohesion and focus and the school found itself craving a modern music curriculum that non-music specialists could also use confidently. The school received a whole staff CPD training session with Musical School as well as model lessons in order to upskill and empower the KS1 and KS2 Class Teachers. In addition, time was spent with the schools Music Coordinator to decide how the package would work best for them and be tailored to their specific needs in order to create and embed a complete Musical School offering. Once the programme was implemented there was a noticeable improvement in the schools music department. Musically, everything in the school is now linked together, from Foundation Stage to Year 6. Whole Class Ensemble Teaching (WCET) and small group instrumental lessons were an integral part of the schools music department turnaround and the children that learn an instrument can now perform as part of their class music lessons. The teachers at Read St Johns are now using Charangas Units of Work as part of their curriculum delivery. One Class Teacher commented that, The kids love it! They are so engaged, like never before. The songs are relevant and the school is buzzing! It’s inspiring, innovative and simple to use for non-musicians. The Head Teacher at Read St John’s also explained the difference that the programme has made at the school , Musical School has had a fantastic effect; teachers can track childrens progression clearly and the supporting planning and assessment is easy to use. It has met all of our needs it’s fantastic to see the children and staff engaging with and enjoying music so much! Get PricingTake a Free TrialThe trial is completely free, places you under no-obligation and does not require any card details.